A heartwarming picture book about friendship that is sure to become a classic from debut author-illustrator Jonathan D. Voss. Olive is a little girl who likes the types of adventures that exist in books. Her best friend Hoot, a stuffed-animal owl, prefers the ones that take place in the real world. Today, Hoot gets to pick the adventures. At first, Olive isn't sure if she's brave enough for the activities Hoot has picked: flying a makeshift hot-air balloon and navigating raging rivers. But when her dearest friend gets hurt, Olive discovers that she's not only brave, she's brave enough for two. Told with whimsical text and filled with bold, captivating illustrations, Brave Enough for Two is the story of a little girl, her stuffed-animal owl, and their loving friendship. Jonathan D. Voss was a portrait artist and graphic designer before becoming a children's book illustrator. Winnie: The True Story of the Bear Who Inspired Winnie-the-Pooh by Sally Walker was his first book. 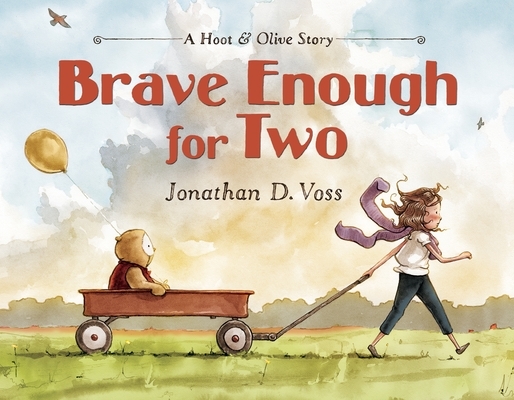 Brave Enough for Two is his author-illustrator debut. He lives in North Carolina with his family.